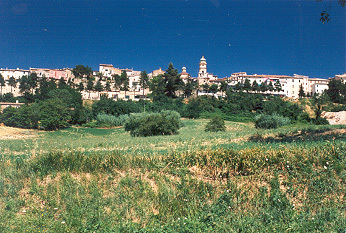 Apiro, a town of 2,497 inhabitants, lies on a hill rising to 1,693 ft. above sea level, situated at the foot of Monte San Vicino (4,b52 ft.). The surrounding territory, rolling hills whose undulating slopes stretch between the valleys of the rivers Esino and Musone, is hemmed in by the Sibillini mountain range on the west, and by another range of high hills toward Cingoli on the east. Lying, then, in the center of a wide valley cradled by mountains, Apiro offers a magnificent panaroma hewn from the towering peaks of the Gran Sasso and the Maiella. Although the bulk of the inhabitants resides in the town proper, not a few live in the outlying rural areas or districts. The historical center of the town, rich in works of art, is set within fortified castel walls, whereas the entire adjacent area is, in its own right, strikingly quaint. Coming upon it, in fact, the visitor is immediately overwhelmed by a sense of peace and serenity, and by a keen perception of diligent activity. 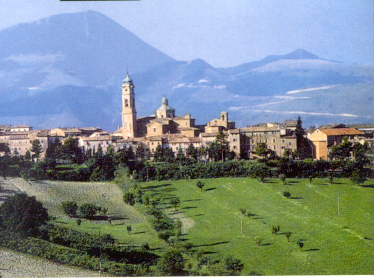 Though apparently out-of-the-way, the town is well connected by paved roads and by public transportation with the larger cities in the area: Jesi, at only 25 km. away; Fabriano and Macerata at 45 km. distance; and Ancona, capital of the Region, at 63 km. Motorway A14, exit Ancona North, direction Roma. S.S. n. 16 exit Apiro-Mergo.